On 25 of May 2018, American brand Anthropologie, which focuses on interior design and fashion, will be opening its first location in Germany in Central Düsseldorf. Part of URBN, which also owns Urban Outfitters, the one-stop Anthropologie destination will offer an art-inspired assortment of clothing, homewares, and niche products in the beauty sector over 950 square metres on the Königsalle. This push into the German retail market is one of the many examples of how the local market is increasingly focusing on lifestyle concepts and offering a wide variety of products to give customers a more attractive shopping experience. The world of high-end fashion brands is an established example of how fashion houses like Armani or Versace have developed homewares lines that are integral and economically important parts of their empires. But the fact that more affordable brands like H&M and Zara have their own stores offering homewares in prime locations in German city centres is a disruptive new development that is threatening the local furniture sector. Conventional suppliers of home accessories and bedding are starting to realise they have matured alongside their customers, and have failed to adapt to a new generation of shoppers who are looking beyond Ikea for strong brands with a medium prince point. That is why, according to IFH Cologne in 2017, homeware brands and textile retailers accounted for just 26% of homeware and textiles sales in 2017. Customers are now approaching the homeware category in the same way they buy their clothes: trend-oriented, impulsive and seasonal. Fashion companies use a language customers already know and understand to offer more products. “Our stores are designed so that our customer feels as though she is stepping in to the Anthropologie world. For example, printed silk dresses can be found showcased alongside beautiful ceramic displays, our intricate accessories are complemented by chic stationery sets; we understand that our customer will be looking to channel her own sense of style not only in the way that she dresses but through the way she expresses herself in her home. At present, our business is split with approximately 60% apparel, 40% home,” says Gisela Garcia Escuela, managing director for Anthropologie in Europe, to FashionNetwork.com. The combination of fashion and homewares has long existed in Germany, where many brands including Marc O’Polo, Joop, Bugatti and S.Oliver have licenses for bedding or bathroom products. They regularly show higher growth rates in these areas than in their main fashion category. So is the wider sector finally catching up? If you look at the retail landscape in Germany, you might certainly think so. Just last year, the luxury department store Oberpollinger in Munich launched a brand new sales concept dedicated to homewares. The concept store chain Apropos is continually expanding its furniture and home décor range, as it did last year with a special space for the brand Fornasetti. And independent retailers elsewhere are supplementing their range with textiles, pillows, scented candles and ceramics. “The German interiors market is mature and established by comparison to other areas of the world, so it is very encouraging to see retailers placing furniture and home side by side with fashion collections. Traditional brands do an incredible job of offering high end and aspirational pieces, but often they are not affordable or accessible for a wider audience. So when a fashion brand starts to incorporate aspirational and affordable homeware alongside their apparel collection, customers respond positively because now decorating their home becomes as accessible as updating their wardrobe. We turn over interiors stock faster than traditional homeware stores because we know that trends are playing a bigger role in the home, and there will be times in the year when we see a spike across the various categories (décor, table top, gifting and entertainment) depending on what’s important to our shopper at that time,” says Gisela Garcia Escuela. 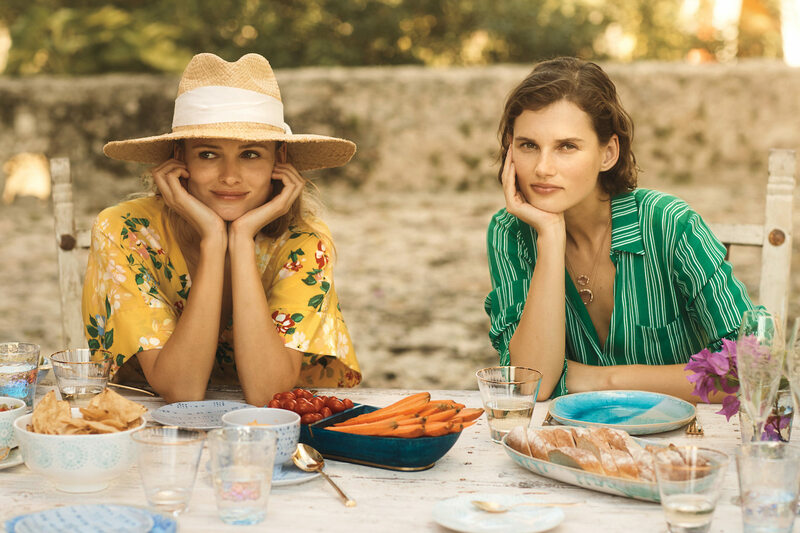 With help of a smart combination of different categories, brands such as Anthropologie are creating ever-stronger lifestyle universes, and retailers are developing their own signature through a diversified shopping range. Sectors are being merged into new concepts, creating an answer to the holistic shopping habits of their consumers. Those who recognise this potential and have their assortment under control will become winners.